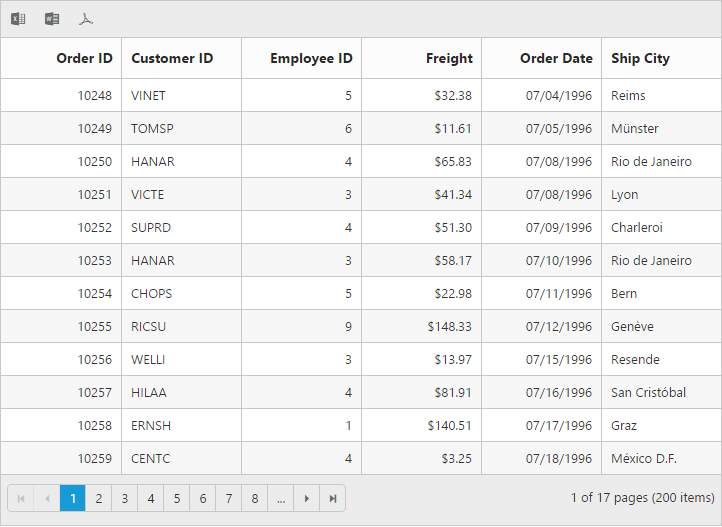 Exporting feature provides support to export Grid data into excel, word and PDF files. The tool bar has ExcelExport, WordExport, PdfExport icons that are used to perform exporting. When you click the toolbar exporting icon, it internally invokes the export() public method of Grid object to make export. You can also invoke export() method manually to make export. Export Helper functions are available in the assembly Syncfusion.EJ.Export, which is available in the Essential Studio builds. The list of assemblies needed for the grid export is as follows. In ASP, exporting is achieved by using Grid control server side method. Using Export() server method in Grid server side event, you can export the Grid into excel, PDF and word documents. Refer the knowledge base link to export the Grid when it is rendered inside UpdatePanel. We can handle the multiple Grid exporting in server side while exporting the Grid to various files such as Excel, PDF, Word. To export the grid with columnTemplate we have to set IsTemplateColumnIncluded as true in the parameter of the export method. You can handle the template elements in server side event while exporting grid to various files such as Excel, PDF and Word. The server side events available in template column exporting and its argument types are listed in the following table. ServerExcelColumnTemplateInfo currentCell, Row It returns the current cell and row of excel sheet. ServerWordColumnTemplateInfo currentCell, Row It returns the current cell and row of word. ServerPdfColumnTemplateInfo currentCell, Row It returns the current cell and row of PDF. To export the grid with detail template we have to set IncludeDetailRow as true in the parameter of the export method. You can handle template elements using server side event while exporting grid to various files such as Excel, PDF and Word. The server side events available in detail template exporting and its argument types are listed in the following table. ServerExcelDetailTemplateInfo currentCell, Row It returns the current cell and row of excel sheet. ServerWordDetailTemplateInfo currentCell, Row It returns the current cell and row of word. ServerPdfDetailTemplateInfo currentCell, Row It returns the current cell and row of PDF. In Exporting, custom summary needs to be handled using QueryCustomSummaryInfo server-side event.